I’m Zoe, I’ve worked in the library at Lord’s since March 2012. Recently I took over running http://www.takingthefield.com/ . Taking the Field is an oral history project about grass-roots cricket. My other duties at Lord’s largely involve cataloguing lots of cricket annuals. I’m going to use this blog to tell you about what I do – you lucky lucky people! 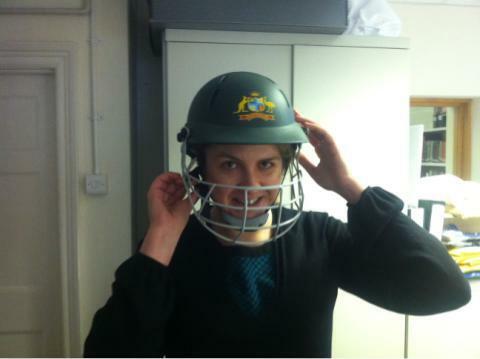 Zoe, as a librarian who loves cricket I have dreamed about having your job. I am so jealous! I second the sentiments above! I love cricket and have worked around books for about 4 years now, but if my place of work were Lords rather than the centre of Manchester I think I’d be much happier! I do keep having to remind myself how lucky I am. It’s an amazing place to work. This looks brill, Zoe. I’ll be checking it out in more detail very soon. Keep up the good work !! I’ll try to keep adding new stuff so you’ve got plenty to read. Got loads of more routine tasks to do in the run up to Christmas though, like cataloging old periodicals – not so much fun! But maybe I’ll see some interesting old articles while I’m cataloging. Thanks for liking my post on my blog! Your job sounds amazing, you must love it! Your blog is great and makes a fun read! Thanks. Like most of the above comments, I’d simply gurn to have your job. Interesting blog, will be sure to keep an eye on it! How interesting! And working at Lords…Cricket’s Mecca…must be special 🙂 Will be back for more! Nice one! Thanks for checking out my blog,I’ll be following yours now. Whoa! How fab is your job?! Archives! Cricket! Lords! I bet your job doesn’t get boring for very long. Great idea for a blog, Zoe. Now stop beating the Aussies.